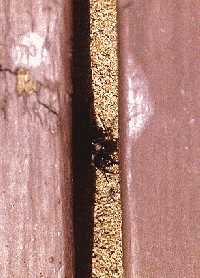 Size: Adult - 1/16" to 1/2"
Identification: Light to dark reddish brown ants. Antennae are long and elbowed without distinct club. Three or more pairs of sharp spines on the waist. Can be seen marching along well-worn trails. Those going back to the mound will have a large piece of leaf tissue. Biology and Life Cycle: Complete metamorphosis. Swarm from early April to early June. Workers travel on well-defined trails. They cut leaves and buds and take them back to the mound. They also gather some seed. Most active from May to September, foraging at night. Mounds are huge. They use the organic matter to build a compost pile underground. They feed on the fungus that grows from the compost. Queens can live ten years or longer. Habitat: Nests in well-drained soils. All vegetable and landscape plants. Feeding Habits: Feed on fungus that grows on the compost pile made in the mound. The ants use all kinds of plant materials to make the compost piles. Howard's listeners report that these ants even use the berries and leaves of mistletoe. Economic Importance: Leafcutting ants will defoliate and kill food and ornamental plants. One of the most difficult ants to control. Natural Control: Lizards and birds love to eat 'em. Thick mulch around all plants helps. Beneficial nematodes help control all pests that live in the ground. Organic Control: The Texas leaf cutter ants are among the toughest to control. Thick mulch around all plants helps, especially cedar much. Beneficial nematodes also help. Treat the mounds with plant oil products such as EcoSafe or BioSafe. Wettable sulfur works well if mixed with water to flood the colonies. We have received good reports from people spraying the leaves of the plants being attacked with spinosad. Flooding the colonies after building a dam around the surface openings usually works. 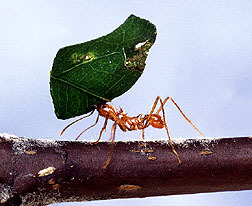 It is also reported that the ants can be kept out of the foliage of trees by wrapping the trunks with aluminum foil. Maybe - maybe not. Insight: These ants are master compost makers and mushroom growers.